four separate volumes, each one affordably priced in a paperback edition. These works are facsimiles of the eighteenth-century first edition and are undistorted by later interpolations. 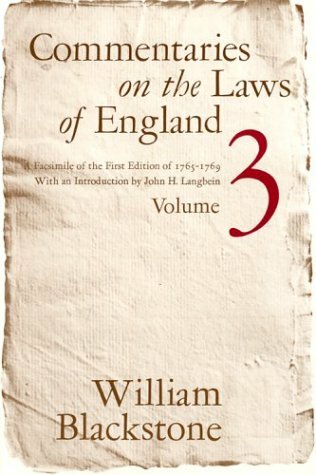 Each volume deals with a particular field of law and carries with it an introduction by a leading contemporary scholar. Introducing this third volume, Of Private Wrongs, John H. Langbein discusses Blackstone's account of procedure and jurisdiction, jury trial, and equity. He also examines Blackstone's uneasy attitude toward the celebrated legal frictions of English civil procedure.